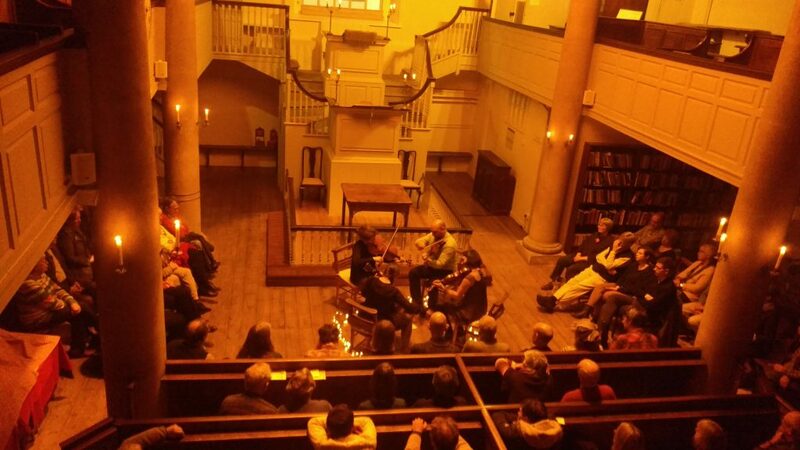 Folk at the New Room is a candlelit concert series taking place in a beautiful 18th Century chapel. Launching in November 2017 with Methera, Folk at the New Room has welcomed artists including Sam Sweeney from Bellowhead, Three Cane Whale, Boldwood, Ian A.Anderson, Daniel & Emma Reid, I Fratelli Tarzanelli, and Bristol Folk Singers, with many more exciting local and international artists to come. Gigs usually take place on a Thursday evening at 7.30pm, with doors at 7pm. The New Room cafe is open beforehand from 6.30pm serving drinks, soup, and a delicious selection of homemade cakes. Tickets from £14 (£12 advance), £12 concessions (£10 advance), and are available online, in the New Room shop and on the door. Monday 8th April 2019 - Sturla Eide and Philip Miles weave their differing musical roots into a wonderfully diverse yet intricate tapestry of sound. Expect to hear the finest folk melodies blended with beautiful piano accompaniments and upbeat tunes on accordion and fiddle. With Nordic Tunes Workshop beforehand. All ages welcome to this 1 hour workshop led by the duo - bring your instrument or just come to listen. Tickets from £8. Saturday 18th May 2019 - Andy Cutting is a rarity. A musician's musician (BBC Radio 2 Folk Award Winner Best Musician 2008, 2011 & 2016): a soulful and technically outstanding melodeon practitioner with an ear for a fine tune. Thursday 24th October 2019 - Merging folk traditions from both sides of the Atlantic, Norwich based folk trio Alden Patterson and Dashwood weave rich vocal harmonies, fiddle, dobro, guitar and mandolin around beautifully written original songs and melodies. Thursday 14th November 2019 - Americana-roots and folk duo from Cabot, Vermont, Dana and Susan Robinson combine vivid songwriting and storytelling, with fiddle tunes, clawhammer banjo, elegant melodies, and rich harmony singing.